WPA will move into 1,500 square feet in the main Atlantic Plumbing building at 8th and V Streets NW - adjacent to the 9:30 Club, DC's renowned music venue - by early fall of 2015, which coincides with the launch of the organization's 40th anniversary celebration. "We are thrilled to offer our artists and the community a dedicated exhibition space. Combining WPA's administrative offices with new galleries in such a visible, flexible, contemporary space will greatly enhance our programming capabilities," said WPA Executive Director Lisa Gold. "We are imagining exciting new possibilities for our artists, partners, and supporters to experience art and engage in dialogue. And, as we approach this important anniversary milestone, this new space is a transformative step towards an illustrious future for WPA." "WPA is a perfect fit with our vision for Atlantic Plumbing," said Robin Mosle, a JBG Executive Vice President. "We are pleased to partner with this inspiring and longstanding arts organization to bring new access to a wide range of art - not only to Atlantic Plumbing, but to the immediate community recognized for its rich arts heritage." 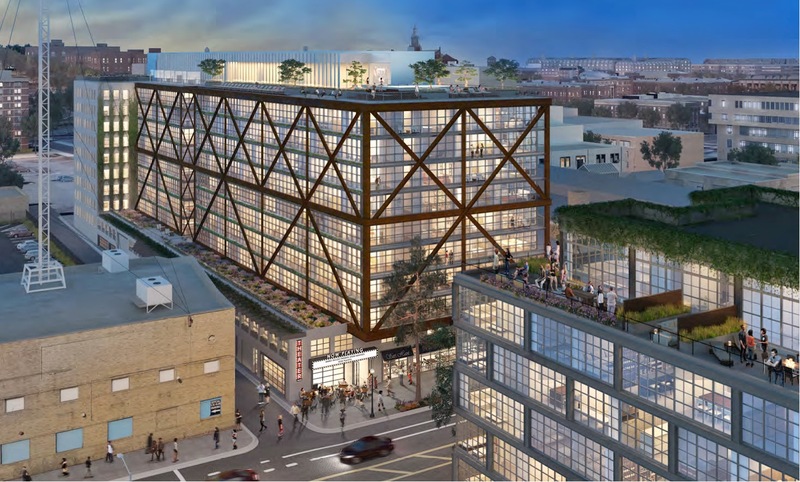 The WPA space fronts 8th Street NW and will include a gallery to house exhibitions and events, staff offices, and retail space for original artists' works. The space will operate Monday through Saturday from 12 p.m. until 6 p.m. with occasional evening events. "The U Street corridor is an ideal home for WPA, given its artistic spirit, history, and diversity," said Kim Ward, chair of the WPA Board of Directors. "Since its founding, WPA has programmed and presented exhibitions in a variety of spaces - remaining versatile and responsive to the art of the times, while acting as a leader in creating partnerships with other arts organizations and institutions. We will continue to do that from a location that will provide a strong community hub for the arts with expanded room for programming and exhibitions." Also moving are art entrepreneurs Leigh Conner and Jamie Smith, who have announced they are seeking the next DC home for their powerhouse CONNERSMITH gallery and the (e)merge art fair office. Recently, Smith and Conner accepted an offer from the Capital Fringe Festival to purchase their art space in NE Washington, DC. Smith and Conner moved their business from Dupont Circle NW to the Trinidad neighborhood in NE DC in 2007 when they purchased an auto body shop at 1358 and 1360 Florida Avenue, NE. The art entrepreneurs converted the two-story building and courtyard into an arts space at a time when the area was known for multiple homicides and police checkpoints. In the renovated space, CONNERSMITH presented, free to the public, 56 solo exhibitions and 10 group shows of art by established, mid-career, and emerging artists, including Leo Villareal, Zoë Charlton, and my former mentoree, the immensely talented Wilmer Wilson IV. A gallery hub formed with the arrival of neighboring galleries, demonstrating the transformative power of art within a resilient community. While based in Trinidad, CONNERSMITH supported its artists’ exhibitions in museums and biennials nationally and abroad and made over 32 presentations at international art fairs. In 2011, Smith and Conner launched (e)merge, DC’s own international contemporary art fair. Smith and Conner are very enthusiastic about Capital Fringe’s acquisition of the property and look forward to the space’s continued arts usage with the realization of Fringe’s vision for their festival’s new permanent home. CONNERSMITH will celebrate its last exhibition in the Florida Avenue, NE space with the opening of the annual student show, Academy 2014, and pre-fair party for (e)merge, on July 12, 6-9 pm. WaPo story with some misquotes inaccuracies here.